Bellmore, New York, USA. 19th July 2017. 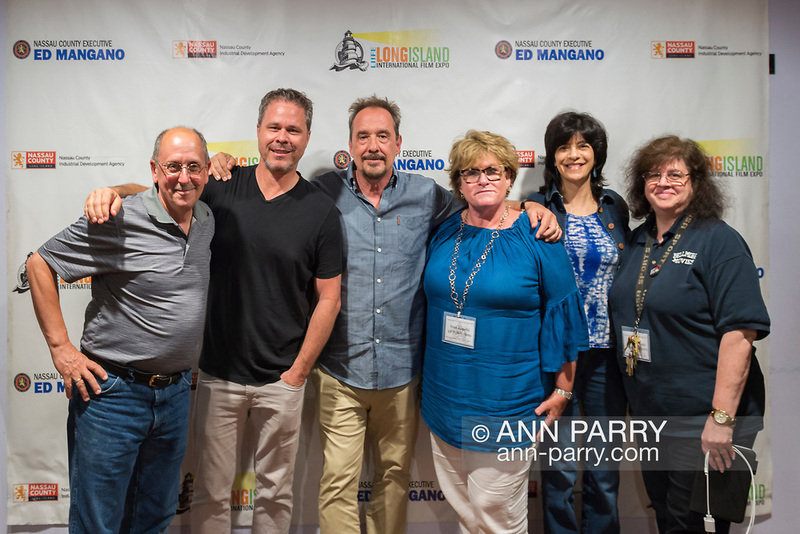 L-R, HENRY STAMPFEL, BRAD KUHLMAN, LOU DiMAGGIO, TRISH APPELLO, Maria Pusateri, and ANNE STAMPFEL pose during final Screening Night of Long Island International Film Expo 2017 at Bellmore Movies. The last film screened was the feature documentary "Where Have You Gone, Lou DiMaggio?" by Director Brad Kuhlman about comedian Lou DiMaggio contemplating a comeback after 20 year away from stand-up comedy. Henry and Anne Stampfel are the owners the Bellmore Movies, and two of the co-founders of LIIFE. Henry Stampfel is President Chairman Treasure and Trish Appello is Secretary of the Long Island Film/TV Foundation which, along with Nassau County Film Commission presented LIIFE 2017.